So, this morning was mostly spent waiting for a surveyor to come around and poke about our house. He was late. By over an hour and a half. 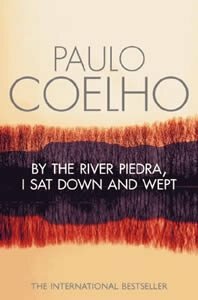 Anyway, with all the waiting, I managed to start and finish By the River Piedra I Sat Down and Wept by Paolo Coelho. I'd read The Alchemist a few years ago and loved it and was really looking forward to another of his books. Not sure why it took so long, but anyway - I had pretty high hopes for this one. And I was disappointed. It just didn't touch my heart the way The Alchemist did. I didn't feel moved or inspired. In fact, I didn't quite understand the ending at all. Maybe it was one of those books that if I read it at the right time, it would have meant a lot more, but now wasn't the time.